Let me start off by stating that I'm no amateur to waterfalls. I've seen some big falls including the Niagara Falls in New York, Akaka and Hi'ilawe Falls in Big Island and Waimoku Falls in Maui. But the sheer grandeur of Icelandic waterfalls is incomparable. I guess it's something to do with pure glacial water melting down from the mountains because of the volcanos underneath. Just what you would expect from the land of ice and fire! Here's the list of waterfalls that we got to see in Iceland - in the order in which we saw them (It is impossible to rank them by their beauty because all of them are spectacular). 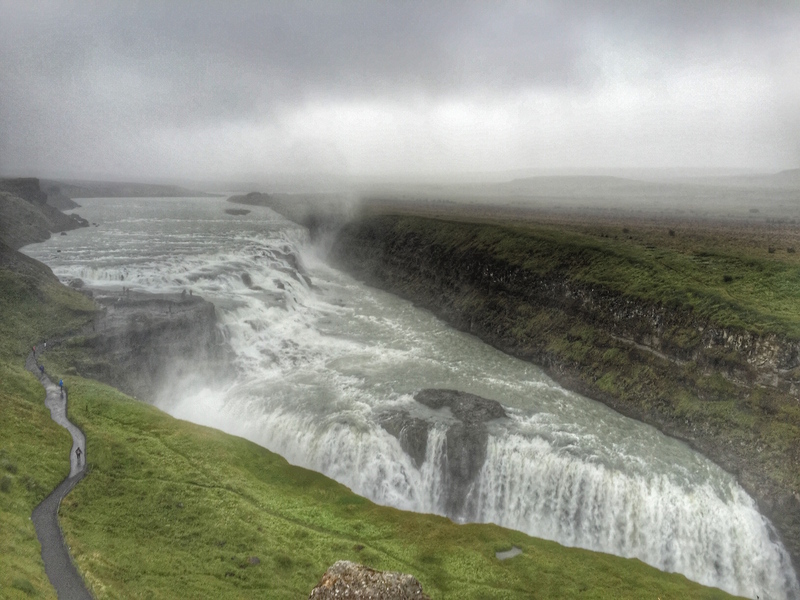 This waterfall is a part of the touristy golden circle - so this is possibly the most-seen waterfall in Iceland. This is a wide two-drop waterfall - and the second drop is into a crevice-like canyon, so it's impossible to actually get to the bottom of the falls. The most unique thing about these falls was that the two drops are sort of at a 90-degree angle to each other, which allows you to get a great view of both the drops. You can see these falls from at-least four different view points - and all of them are worth going to. We got completely drenched (because of the waterfall mist) as we went to the closest view-point which is on a huge rock ledge next to the first drop. I think the sheer size of the second drop was beyond belief. It seemed bigger than it actually was as you couldn't actually see the bottom of the falls because of the mist. We were beyond impressed with the very first waterfall we saw in Iceland :). You just need to show up to be amazed. 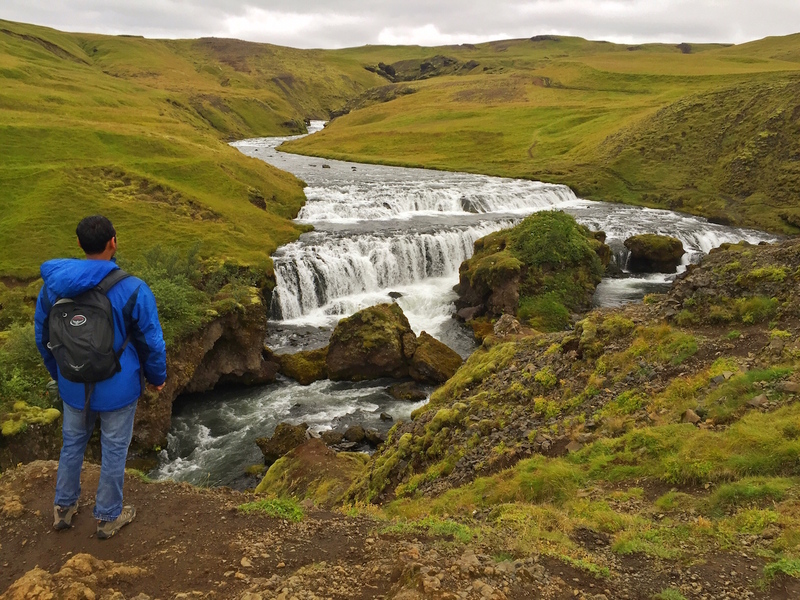 Although not part of the golden circle, these falls are in South Iceland and less than couple of hours drive on the ring road from the capital Reykjavík. So these falls are also popular among the tourists. I consider this a picture-perfect waterfall - a single big drop with the right width and height. You can see these falls from where it hits the ground (which makes for the best view), but be prepared to feel incredibly tiny staring at the top of the falls. After the big drop, the water continues into a small river. You can also hike to the top of the falls and get a different view - which is pretty beautiful as well. The hiking trail continues along from the top of Skógafoss - and we walked for a little while to see a few more waterfalls in between the green valleys. Pretty gorgeous views I'd say. I'll admit these falls are a little harder to get to than the previous one's. 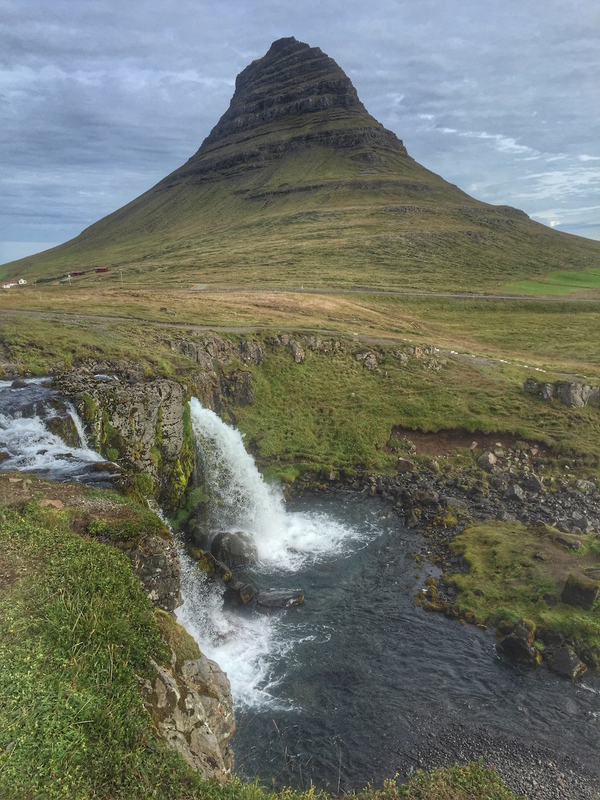 This waterfall can be accessed via a hiking trail in Skaftafell National Park, and this waterfall hike is a pretty good way to spend your time in the National Park after going on a glacier hike (which is exactly what we did). As you walk along the trail, you can spot these falls from afar - this is a pretty single drop fall. But the real beauty is when you get down the mountain and see the falls up-close. 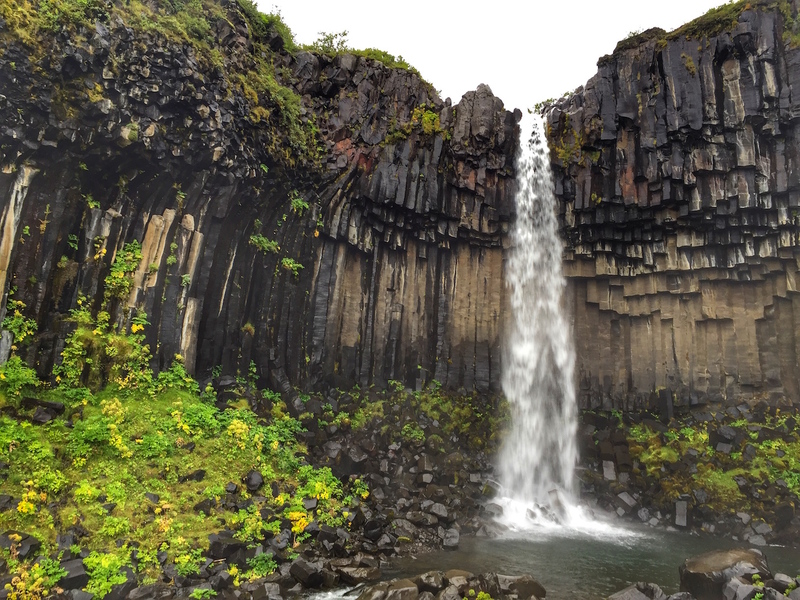 That's when you notice the beautiful dark lava columns behind these falls - which give it such a distinct appearance. Very unique and very pretty. The hike to the falls is about 5 km round-trip - which also gives you the opportunity to explore the national park and see it's plant-life. All in all, I'd say this hike is worth it! The one thing we noticed about Dettifoss was that the waterfoam wasn't as white and the water itself wasn't as clear as the previous falls we had seen. This is because the glacial water melts into a river, and the river picks up a lot of mud and sand from the soil before it hits these falls. So now that you've seen Dettifoss - you think this is it. Nothing can impress you more than this - but then you see a hiking trail at Dettifoss showing the way to Selfoss about 1.4 km one-way. As you keep walking over the boulders in that trail, you see people returning back and then, you get a first view of the Selfoss falls from the trail. Wow! These horse-shoe shaped falls are really really wide. The drop isn't huge but the width is staggering. I tried to count the number of individual falls making up Selfoss, and lost my count around 15. I think the best part about Selfoss was getting these beautiful falls entirely to ourselves during the sunset time. As the colors were changing on the sky - so was the view. Every minute spent here was mesmerizing. These falls are upstream to Dettifoss, so the water was clear and prettier. Don't miss these falls - more so during sunrise or sunset. So these falls are located right next to the ring road between Lake Mývatn and Akureyri in North Iceland, which makes it very easy to access them. These falls aren't very tall but are very wide - sort of "C" shaped. The falls are actually split by giant rocks in the middle of the river. This makes it look like it's actually multiple falls - small falls over the rock next to wide falls. This makes it look very beautiful. You can see the falls from multiple view-points, we saw it both from afar and up-close. As long as you don't expect to have it all to yourself - you'll be pretty happy with these falls. These falls were right next to Kirkjufell mountain in East Iceland, and they're very easy to access. These falls are not mighty or tall or wide in any way - but make for a pretty view along with the mountain. We saw these falls in the morning so there wasn't a lot of crowd, but I'm sure it will be busier during peak hours. Try to catch this mountain + falls during sunrise or sunset - I'm sure that would be the best view. Listing down some falls that we couldn't see, but hope you get to see and enjoy them! What are the most beautiful waterfalls you've seen in Iceland, or elsewhere?